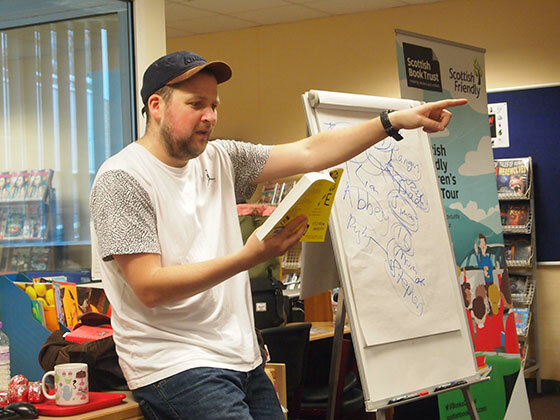 This October the Scottish Friendly Children’s Book Tour visited 10 secondary schools with the fantastic author and spoken word artist Steven Camden. The tour kicked off at Arran High School where we were met by the smell of freshly baked pastries (which we all agreed was a brilliant way to start the school day!) before a very windy ferry ride took us back to the mainland to visit schools across North Ayrshire, East and West Dunbartonshire, finishing a jam-packed week of events at Rosshall Academy in Glasgow. Steven shared his infectious enthusiasm for stories and passion for language with over 1200 pupils, encouraging them to share ideas, play with words and not to be afraid of a blank page. Pupils worked together to create characters and build a story around them, quickly throwing out ideas and making connections to find exciting starting points to jump off from. Steven’s brilliant novels Tape and It’s About Love are inspired by stories, places and people he knew growing up in Birmingham and he encouraged pupils to use their own (embarrassing!) memories to bring their characters to life. Even the most reluctant writers were buzzing with ideas, showing just how inspiring Steven’s sessions were. As one pupil said; ‘I didn’t really expect to like it, but then I was captured’. A huge thank you to Steven for a fantastic week and to all of the staff and pupils at every school for their energy and enthusiasm! For those not lucky enough to go to one of the schools which Steven visited we ran a competition to win a signed copy of It’s About Love. Congratulations to Theresa from Kelty Douglas who correctly guessed that Steven performs spoken word as Polarbear and not Marmoset!